The Forest Service has animated maps showing annual observations of insect activity as detected during aerial surveys of Washington and Oregon. I'm not sure why someone would choose green as the color to indicate trees defoilated by mountain pine beetle or western spruce budworm, and gray to show unaffected regions. You just have to use your imagination -- and you might not have imagined the extent of damage from these pests! Click the map below. of 24-28 years. 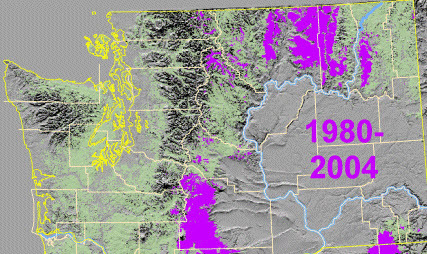 Source: USDA Forest Service. ﻿﻿﻿ Maps will automatically advance every 2 seconds (or every 4 seconds for the slow versions) until the final cumulative map is reached. To restart the animation, click on the "refresh" icon at the top of your browser. These maps are based on cooperative aerial surveys conducted by Forest Health Protection staffs of the Oregon Department of Forestry, Washington Department of Natural Resources, and the USDA Forest Service Pacific Northwest Region. Aerial survey data for 1980-2009 are available in both .e00 and shapefile formats. If you have a use for those, you probably already knew that.